When David Gessner returned to Cape Cod, where he spent summers as a child, he noticed something he had never seen before: hawks with magnificent six-foot wingspans and dark masks. 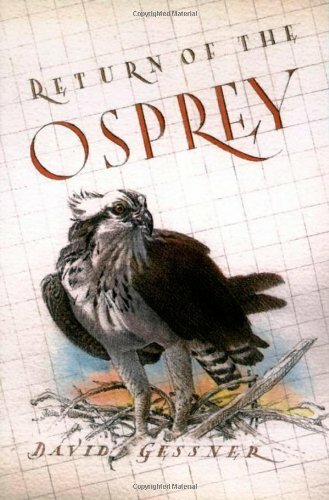 In Return of the Osprey, Gessner sets himself on a simple quest: to watch these great birds and learn about their astonishing comeback to the Atlantic coast after a twenty-year absence. In the process, he takes us on a journey into the wild and the tame, the beautiful and the fragile. Over the course of a full nesting season, Gessner immerses himself in the lives of these majestic birds. He observes their remarkable adaptability, their astonishing fish-catching skills, their housekeeping habits, and, when the chicks are born, both their savage and gentle ways of nurturing. For Gessner, spotting an osprey dive for fish at forty miles an hour becomes a lesson in patience and focus, watching the birds build their nests illustrates the vital task of making a home, and following the chicks' attempts to fly show him the value of letting go. He discovers the rewards of slowing down and the discipline of waiting and watching. And he witnesses an extraordinary event: the survival of ten young ospreys, the most his Cape Cod neighborhood has seen in more than half a century. Return of the Osprey is a story of a remarkable recovery, a celebration of place, and a thoughtful meditation on finding one's way in the world. There was a time, not so long ago, when the osprey, or fish hawk, was a common sight along the New England shore. Taking up residence in tall trees that commanded a wide view of sea and sky, the osprey summered along the Atlantic coast, migrating far south to Brazil when the weather turned cold, returning north to nest year after year. That ancient cycle was cut short when DDT-based pesticides entered the ospreys' food chain and caused a perilous decline in their numbers. In time, thanks to the efforts of writer-conservationist Rachel Carson and the lawyers and scientists of the newly founded Environmental Defense Fund, the use of DDT was banned throughout the United States, but its effect on the ospreys endured long afterward.